Welcoming the first WWII vet to the book launch was exciting! I have never self-published a book before. neither have I hosted a book launch event for one of my books. 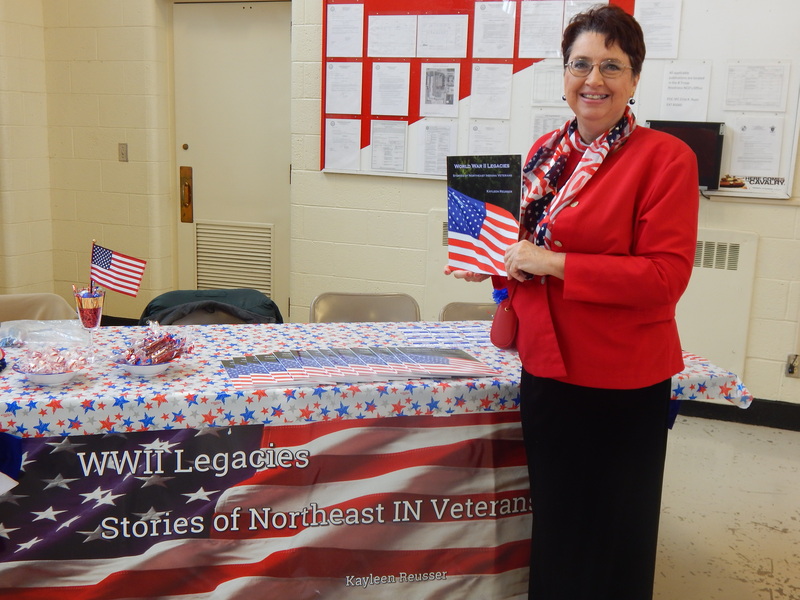 Signed copies of WWII Legacies: Stories of Northeast IN Veterans were signed by the vets during the book launch. Now I can say I’ve done both. My book, World War II Legacies: Stories of Northeast Indiana Veterans, was delivered from my publisher, Ed Schwartz of Oak Creek Publishing a few weeks ago. The publisher has since changed its name to Oak Creek Media (www.oakcreekmedia.com). I’m pleased as I can be with the book’s appearance/ binding. As a librarian, I’m picky about a book’s durability. I’m sure the 8.5×11” book with 61 pages and reinforced binding will hold together through many readings. The photo was shot by Rick Schwartz, Ed’s son. This is a talented duo! I highly recommend them for self-publishing. 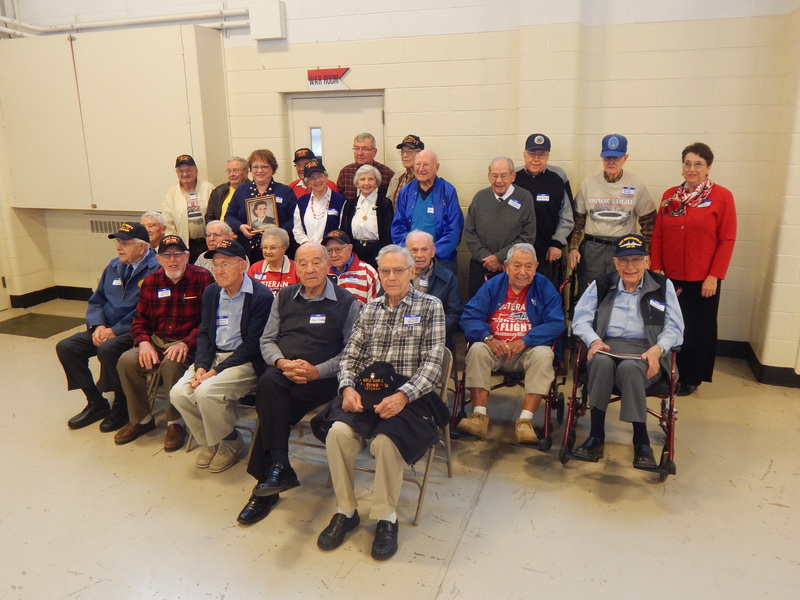 24 WWII vets interviewed for my book were represented at the book launch. My book launch was successful by all accounts. I invited all of the 28 World War II vets interviewed in the book to attend. The event was held in the Bluffton (IN) Armory. It was roomy and the Vietnam-era tank out front lended ambience! Twenty-one vets attended with another three who were deceased represented by family. 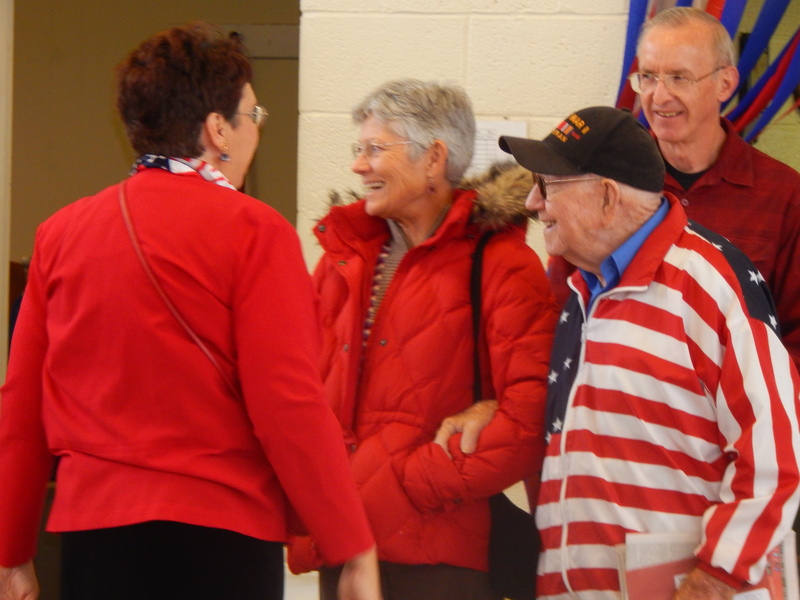 The public verbally and physically thanked our WWII vets for their service. 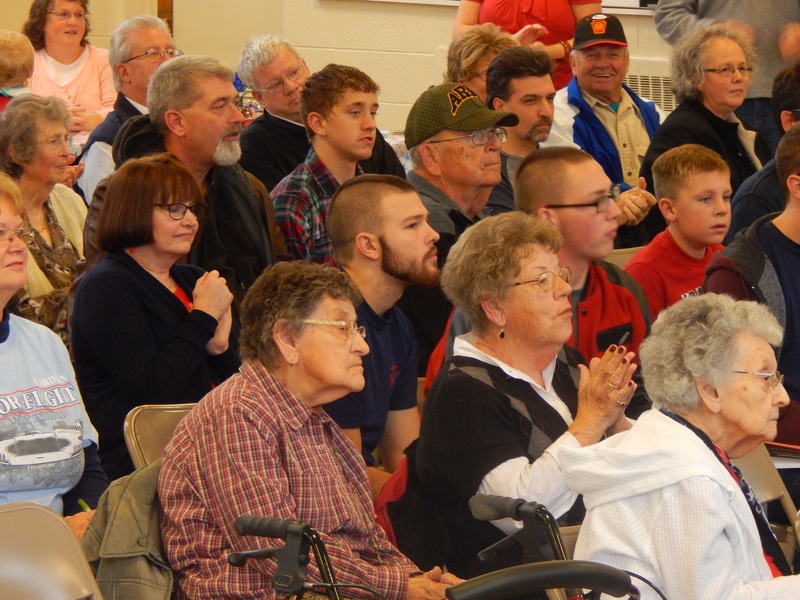 We had a brief introduction in which each vet was recognized, then they sat around tables to interact with the public. 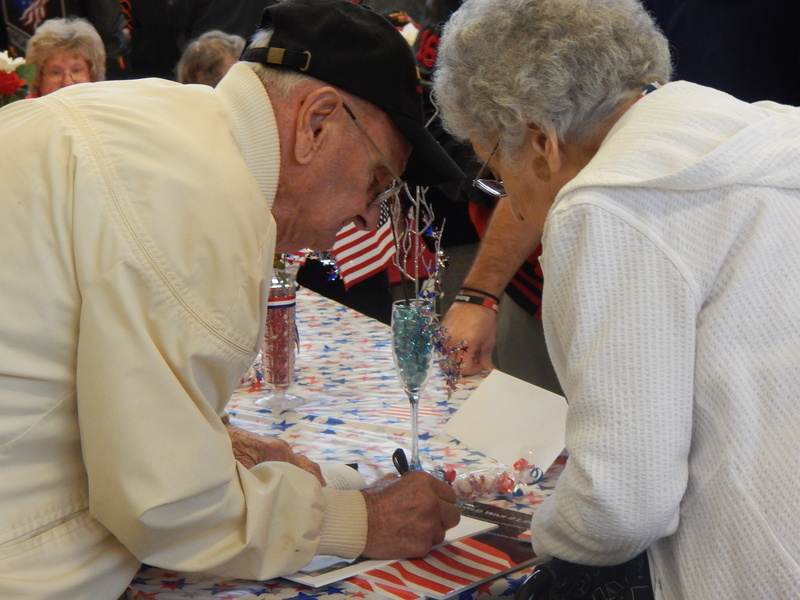 Several hundred people attended to thank the vets for their service and sign copies of the books which were available for purchase. It was a marvelous sight. WWII vets signed copies of WWII Legacies which they were featured in. The vets told me later they were surprised by the large turnout. I think they were all pleased and touched by the expressions of appreciation. Thanks to all who made the effort to tell these people thank you. 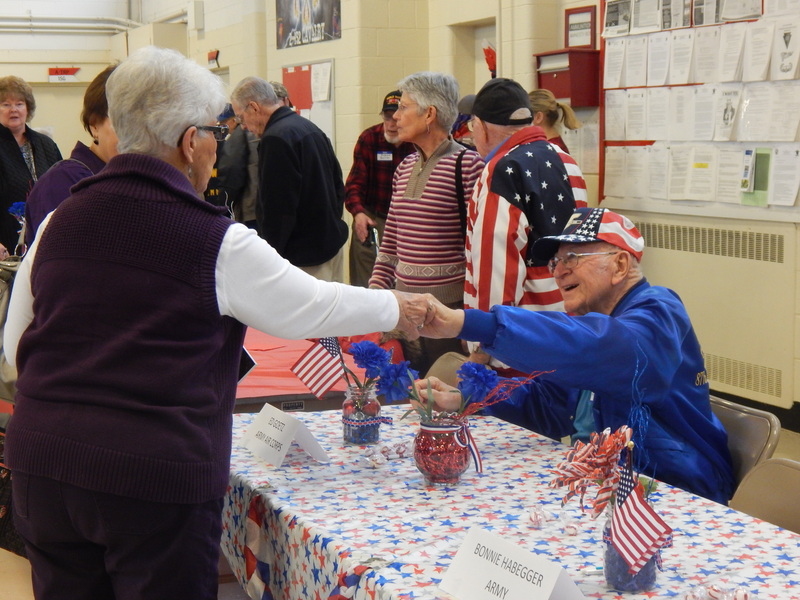 People of all ages turned out to show appreciation to our WWII military vets. Don’t wait for Vet’s Day 2015 to tell a military vet of any era thank you! Tell them with words, send a note, call on the phone, or better yet, take a child to visit them where they live. We have to train the next generation to appreciate our military. The book, World War II Legacies: Stories of Northeast Indiana Veterans, is available from me for $20+$4.95 P/H=$24.95. Please email: kjreusser@adamswells.com for more information. We accept checks and cash. We will mail a copy within 48 hours of receiving payment. They will make terrific Christmas gifts for history lovers, military vets of all eras, schools, libraries. What did you do for Veteran’s Day?